The celebration of Holi has different aspects. It is a celebration of the triumph of good over evil, a carnival of colors, a community festival, and a tradition of ancient spring rites. 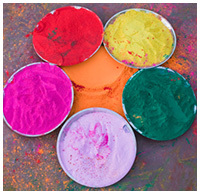 The day before the full moon day of the Holi is called as the Small Holi. 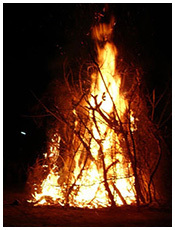 Children up bonfires and sing and dance around it. The evil spirit, symbolized by all those dead leaves, twigs, dirt and filth that collects during the winter months, is thrown up in the fire. Quite a spring cleaning indeed! People sometimes take embers from the fire to their homes to rekindle their own domestic fires. In some community, a pot of new barley seeds is placed for roasting under the pyre before the bonfire is lit up. These seeds are eaten after the fire dies down. The yields in the coming harvest season are predicted by reading the direction of the flames or by the state of the roasted seeds in the pot. Colored powder, or, gulal was earlier made out of Dried seeds of some tropical flowers like the Palash, and dried silt from the riverbed. This has now given way to synthetic dyes, available in the form of pigments. For a glittering effect, fine dust of Mica are also mixed with the powdered dye. People throw these colored powders in the air as they shout "Holi Hai! ", and smear each other with this colored powder. It is a community festival that bridges the social gap. 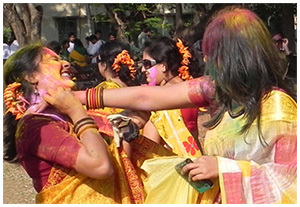 People color each other with gulal and other form of dyes. Young men throw coloured powder and coloured water on women. They also visit homes, distribute sweets and greet each other. Men, women, adult and children all take part in dances and other cultural programs. 0 Response to "Celebration Holi Festival In India"